In Dutch dialects, verbs and complementizers can bear different morphological affixes depending on which nominal element they agree with in their local syntactic domain. For instance, in a dialect such as Tegelen Dutch, the complementizer agrees with the first conjunct of a coordinated subject, while in Lapscheure Dutch, the complementizer agrees with the coordinated subject as a whole. 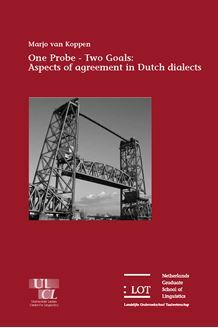 Using a vast array of new data on complementizer agreement, first conjunct agreement, agreement with pronouns, verbal agreement and subject doubling in Dutch dialects, this study argues that the interplay between syntax and morphology is more intricate than has hitherto been assumed. More precisely, it is shown that the syntactic component determines which local nominal elements qualify for agreement with the verb or complementizer. The morphological component subsequently chooses which one of these nominal elements defines the affix on the verb or complementizer, depending on the specificity of the affix. The analysis is extended to similar syntactic contexts in typologically different languages such as Irish, Hebrew, Finnish, Tsez and Arabic. This thesis is of relevance to anyone interested in the relation between syntax and morphology, the study of agreement, the copy theory of movement, coordination, the internal structure of pronouns, or in the study of Dutch dialects.